Hairy Mountain Folk: Great Vegi Restaurant! 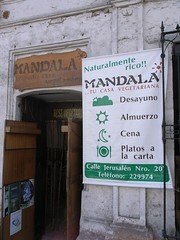 If you are ever in Arequipa you need to try the Mandalay Vegetarian Restaurant…yep even if you aren’t vegi. A lot of the traditional cuisine is vegetarian and many can’t afford meat. Bianca found this one for me (In't she good!) and we had the most amazing set menu for 5 soles (that’s 2aud or 80p)!! I felt so guilty paying so little for a 4 course meal. So what did we have for our hard earned cash? 4) Soup made up of corn, rice, potato, other root vegies, herbs and anything else sitting around. It was so healthy and yummy. Tonight we might be going to that all time international vegi favourite Govinda’s which is a Hare Krishna joint (Hi Andy and Kate, wish you were here).